Check-in will take place Thursday May 4th, 2017 from 1pm-8pm. HTG Sports Services is the official AMP for the 17/18U Girls Edmonton Nationals. All bookings must occur through the HTG booking portal. Saville Floor plan - First floor. Saville Floor plan - Second floor. A parking map is available. While parking is free at the Saville Community Sports Centre, it is VERY LIMITED due to the volume of users during large events. Spectators and teams must plan ahead to give themselves enough time to arrive to the facility on time. Everyone is strongly encouraged to use the public transit, conveniently located next to the South Campus transit/LRT station. Please see their trip planner for more information. During weekend and evening (after 4:30pm) events, overflow parking is available at the Government of Alberta buildings located just north and east of Foote Field. Food options and menus are available in this event flyer. No coolers or outside bags/trays of food is allowed in the facility. Food Services are provided On Site. Athletes can pack individual snacks inside their personal gym bags. Any feedback on the seeding must be submitted to Sandra de Graaff at competitions@volleyball.ca by Tuesday, May 2nd at 2:00pm EST. This will allow us to review the material, follow up with the PTA, and update the information in a timely manner for all teams. Full weekend event passes are available at a discounted rate of $25 until Thursday April 27, 2017 at 12PM ET. Online event passes will be available at full price ($30) until 12:00pm ET the Monday preceding the event. 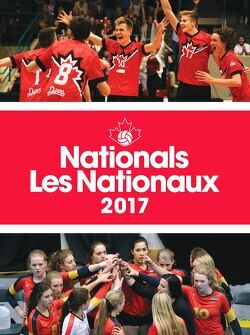 Players attending Nationals will have an amazing opportunity this year to see the Women's National Sitting Team in action! Participants and spectators will have the opportunity to watch intersquad matches, meet and interact with the players, as well as try sitting volleyball! The Sitting Volleyball National Team schedule is now available! The 50/50 winners for Friday and Saturday will be announced here. Winners can pick up their winnings at the 50/50 desk in the front lobby of Saville Centre. Webcast is available all weekend via our Youtube Page. New for 2017! Volleyball Canada is working with Team Spots to pilot a team meal booking service. Visit Team Spots to order your team meal in advance at one of your favorite restaurants and enjoy a quick meal experience once at the restaurant! Every year, we announce 6 All-Stars and 1 MVP for each age group/gender at our National Championships. This year's winners will be announced here.